After a historic seven-year drought period, this winter brought above-average rainfall that has improved water supply conditions, and the City’s water supply forecasts show sufficient supply to meet demands through 2021. While water supplies have improved, conservation remains important to fully recover from the cumulative impacts of the drought, and to preserve water supplies for future dry years. On April 9, 2019, City Council rescinded the Stage Three Drought Emergency and adopted a Stage One Water Supply Condition. With this action, prior drought water use regulations in effect under the Stage Three emergency are lifted; however, the City will continue to enforce its longstanding regulation prohibiting irrigation runoff and failure to repair leaks. Continuing conservation by the community to reduce water use is encouraged. The City’s twelve-month running average water conservation is 30 percent, compared to 2013 water demands. The City is grateful to our customers for making conservation a way of life, which has been vital during the historic drought and will continue to be essential going forward. 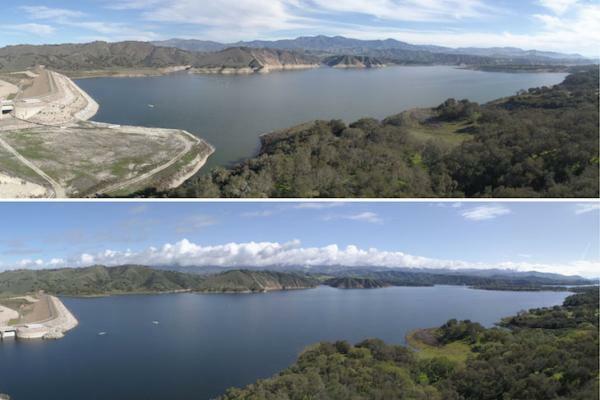 · Lake Cachuma: The federally-owned reservoir is currently 79% full, but it is a shared resource with stored water belonging to other agencies, including downstream water rights. · Gibraltar Reservoir: This smaller reservoir is owned by the City and is currently full. Use of water from the reservoir has been limited due to water quality concerns as a result of the Thomas Fire. · Groundwater: The City relies on groundwater during droughts when surface water supplies are limited. In 2016, the City’s groundwater basins reached historically low levels similar to 1992 (the last major drought). The City has been resting the groundwater basins to let them recover; however, it could take 5-10 years before the basins are completely replenished. · State Water: The 2019 allocation from the State is currently 70% of the maximum annual amount. During the drought, the City contracted for supplemental water exchanges, via the State Water Project, from other water agencies outside the area. These exchanges were necessary to maintain State Water deliveries during the drought, but the agreements require that some water be returned over a 10-year period. The City’s current water debt is equivalent to one-third of the City’s annual water demands, and the City plans to return the water in the next few years. · Desalination: The City’s desalination plant has been operating since summer 2017, providing nearly one-third of the City’s current water demands. The desalination plant has played a key role in improving reliability and resiliency during the drought, and it will continue to play this role by allowing us to rest our groundwater basins and recover from the drought. · Recycled Water: The City’s recycled water plant has been meeting the majority of recycled water customer demands since construction upgrades completed in November 2015. The City is well positioned to accelerate the recovery process with the City’s desalination plant in operation and continued conservation efforts from our community. The City is also initiating a pilot study for potential artificial recharge of treated water into the City’s groundwater basins to help recover the water levels. Regarding water rates, the City experienced significant increases in costs during the drought to provide reliable water sources and ensure public health and safety needs were met. The water rate study conducted in 2017, which informed water rates for Aug 2017–June 2020, assumed that the drought would come to an end within that period. Therefore, the current rates, and the rates that will become effective this July, already reflect a gradual recovery from the drought costs. While the majority of costs to operate and maintain the overall water system are fixed costs, the City’s water rates are structured to encourage conservation, and reduced water usage results in a lower water bill. The City will be reassessing water rates for July 2020 with a new rate study starting this summer. For more information on water supplies, drought, and conservation, please visit www.SantaBarbaraCA.gov/Water. Cachuma @79% "sufficient supply to meet demands through 2020" Citt rescinds water use regulations Seven year drought All those planners and city council need to be shown the door as they prove their incompetence, idiocy, and unsuitability to provide meaningful leadership. This purely political move ignores the realities we face. We know droughts are frequent and recurrent. A two year supply is wholly inadequate. Fire the lot and hire someone who understands long term planning. For those whining about rates: go without water for 48 hours and get back to me on the value of water. What does a gallon of single use disposable water bottle cost? $1-2/per gallon and it flies off the shelves. Your water isn't getting any less expensive so drink up now, it'll all be gone in two years. I find drought related surcharges to be a total joke! The truth of the matter is, we are subsidizing all the new development, period. If they were truly concerned about drought, they wouldn't have allowed all of it at least during the drought. The surcharge is robbery. Really, that should be charged up front to the developers not those of us just trying to make it day to day. What a joke. I am wondering if it is possible , and makes economic sense to "bank" desal water with the state. I hope the plant does not sit idle and rot like the last one. I dont know about banking, but we should for SURE keep that thing functioning. I would imagine anarchy if they scuttled it again and in a few years we are back in a drought and they ask for money to fix it. I just read that Goleta is dropping their drought surcharge. This is funny, "the City will continue to enforce its longstanding regulation prohibiting irrigation runoff" --- every week during the drought, sometimes several times a week, there was substantial runoff from the grass watering at Adelante Charter School on Mason - and often from the adjacent Franklin School. The sidewalk along Wilson was soaked and there were rivulets running down Mason, usually around 11 pm. Government agencies are often exempt from the regulations they enforce. They don't have to do smog checks or buy registration stickers for their vehicles. They don't have to get permits for new construction. They get to say that those solar panels behind the County jail had no visual impacts whatsoever in their environmental report. They get better benefits and pensions than the rest of us. They are the new royalty in our country. At 11 P.M. there are fewer people around to notice. I was told that the schools and parks were using reclaimed water so they don't bother enforcing it with those entities. It is of course still wasteful but the water police are about as diligent as the the real cops are at skate boarding, texting while driving and lights on in the rain violations. Sorry for the thread jack, but this was a great segue op. Our water bill has doubled in the past couple years, despite the fact that we are staunch and steadfast water conservers. We cart our dishwater rinse water (soapless, last rinse) out to the garden. We haul our 1.5 gallons of "starter" shower water (waiting for the hot water to kick in) out to the garden. We take 3-minute showers, turning the water off while soaping up/shampooing hair. We don't water our lawn, but let it go brown every year until rains come. We live like we have to haul our water up from the well in buckets. And yet, our bill keeps going up, up, up. My comment should read "<those> whose water bills are in the first tier <aren't> recognized for their effort . . . . "
I never use more than half the first tier and do all the things you do. It irks me whose water bills are in the first tier are recognized for their effort and willingness to live smaller and have to pay more for every drop of water they do use. This is obvious if you divide out the final bill by actual water used. The more you use, the less it costs per unit. Yes. There always seems to be some sort of justification for a "temporary" increase in water rates, but we have yet to see a single increase retracted when the reason for the increase is resolved. At this point just another Utility money grab. Lake looks full enough to me. Lower my rate ! Since state legislators never fully embraced Gov. Edmund G. "Pat" Brown's original water storage plan (reservoirs enough to plan for a population of 40-million or more,) we now need a series of de-sal plants along the entire coast to augment the inadequate and strained storage/capacity system. We'll be back to Stage 3 in no time with all the new development. Now the drought emergency is over, will the City reduce it's over-bloated Water Conservation staff? I heard from someone that used to work at the City that 15 years ago it was only a staff of 3 people. They have a lot of experience in creating busy work, so don't expect anything. Amen! The water department has a weight problem and should be on a 'diet' since they will undoubtedly want to add more people <when> the next drought occurs. Be sure to look up on Transparent California by name, each member of that visiting team so you can get a better idea of why our water bills won't be going down. Personnel to administer our water polcies probably cost more than the water itself. We had a TEAM from the water conservation department complete a lengthy site visit and produce a three page report with diagrams showing that our commercial fountain was over the maximum square footage and needed to be shut off. The most inefficient use of resources to try and conserve a few gallons of water per year, especially while our agriculture community keeps growing their for-profit crops in essentially a desert. What are these city employees supposed to do now with the restrictions over, create more busy work for the businesses of Santa Barbara to justify keeping their jobs? The hotels are unencumbered because they would simply pass on the cost to tourists, making it too expensive for people to come here on vacation and spend money. That is also the reason for the 20 mill renovation of the Paseo - to trick the unknowing into coming here and spending money thinking it's a nice town only to find out it stinks and is overrun with the homeless. I know many who came once never to return again - there are many other cleaner, safer places to travel that are just as if not more beautiful, for the money! I'm not sure "We can do much better". We're a small town with less than 100K people. A backwater with a nice coastline and mountains. Everyone just has big city expectations. This is what happens when voters keep voting for more of the same. Every election, there are choices and always voters keep the same city employee friendly people in charge. What would it take to break this downward spiral? We get it Pitmix, you love Cathy Murillo. You think she was the best possible mayoral choice in the last election and since has proven to be the most effective mayor in decades. That her years of executive and managerial experience is transforming city hall. She's pushing hard to reduce our debts and expenditures while bringing a slew of new jobs and tax revenues into the city. That our streets, especially our main street and our parks are cleaner and more inviting for families and the elderly. Let's not forget our city's long term finances getting their much needed attention so our kids are not saddled with hundreds of millions in debt for problems they didnt create. Yes, we know, you like Cathy and you think that everything is perfect here in "paradise"... And no, I am not bothered by the city's political leanings. I am bothered by incompetent nincompoops being rewarded for mediocrity. We can do much better. And yet she keeps getting voted back in. Must be really frustrating to live in such an liberal city. Salaries go up, pensions go up, got to pay for all of that somehow. I have to admit that I am part of the problem because I still have some lawn. Haven't turned my backyard into a microplastic generator yet. "The City will be reassessing water rates for July 2020 with a new rate study starting this summer. "——And you know those rates aren't going to go down. There really should be a Grand Jury investigation of the specious "drought-related" surcharges that are "temporarily" enacted, but never go away once the drought is over. The City Water Dept. has been ripping us off for decades.